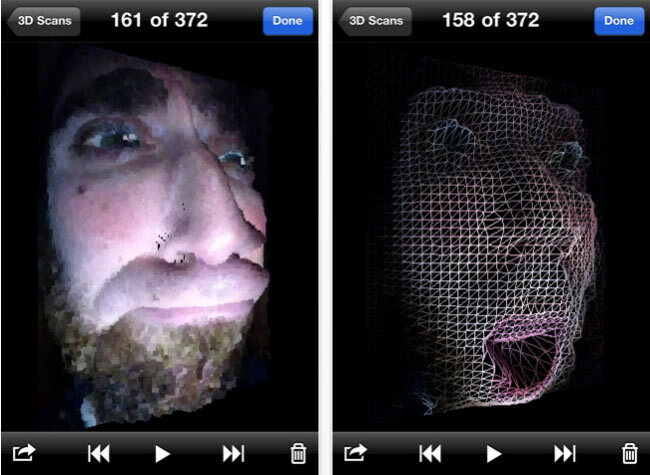 A new 3D scanner app has been developed for the iPhone called Trimensional which takes 4 photos of your face using different lighting effects and combines them to create a 3D model. Once captured the images can then be used to created a 3D printed version of your scan. For best results an extremely dark room is required and iPhone screen brightness must be set to maximum. Currently the 3D scanning app works with the iPhone 4 or 4th Generation iPod Touch. The Trimensional 3D Scanner is now available from the Apple iTunes Store for 0.99 cents a bargain when you consider the cost of alternative 3D scanners. Watch a video of the new Trimensional 3D Scanner App For iPhone after the jump. There is also an optional in-app purchase available, that will allow you to easily export your captured 3D scans into third party software via OBJ, STL or PLY formats. The new Trimensional 3D Scanner app can be purchased from the Apple iTunes Store here.